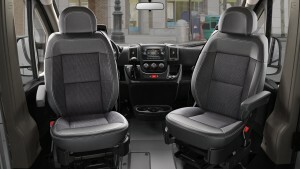 The newly standard features on the 2018 RAM ProMaster include a Uconnect 5.0 infotainment system, which you can choose to equip with navigation. To further help with connectivity and convenience, RAM also added integrated voice command, Bluetooth, and audio controls on the steering wheel. There is also now a rear backup camera as standard, providing safety and making it easier to back up or park even in the full-size RAM ProMaster. The cutaway models and chassis cab get a backup camera kit, as well. There is also a new option of a window grate that has a fixed-glass option on left and right sliding doors. What About the ProMaster City? 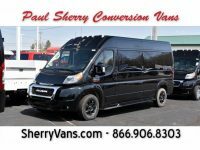 While our conversion vans are based on the ProMaster because of its full-size nature, many Ohio drivers are also interested in the upgrades to the smaller ProMaster City. These models also get the upgrade of the Uconnect 5.0 system. They additionally have the option of the window grate for sliding or back doors, provided the cargo van does not have a partition. Other than these upgrades, the 2018 RAM ProMaster is incredibly similar to the previous model year. 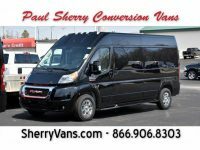 You get the same spaciousness, power, efficiency, turning radius, and range of conversion options. The only difference is that every model now has more of the features that drivers need and want.